Phew, what a day! 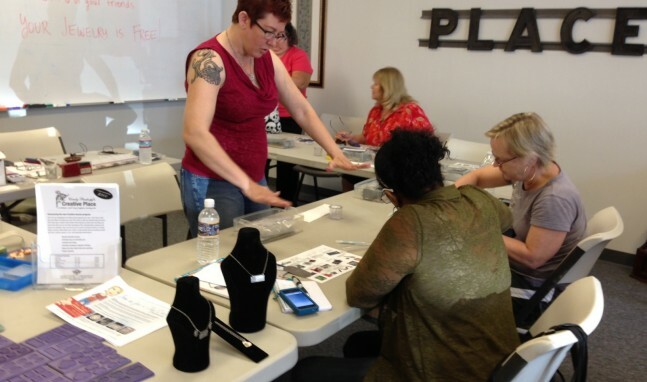 So many people came by to try their hand at making metal clay jewelry for the first time that I had a hard time keeping up! Everyone was so patient taking turns with the seats as each step of the process was completed. There was a great variety of silver clay jewelry created, fingerprint jewelry for Moms, earrings for nieces, birth date charms for daughters, and pendants for keeps. It was so fun! Thanks you to everyone who came from the Art of Adorning last weekend to give it a try. People were so thrilled about what they made, I got the biggest big kick out of it! It was so nice to see friends and new faces, all of whom had no idea how cool metal clay is. But they all do NOW! It seems like there will be lots of Charming Parties and Intro to Art Clay Silver classes in the future…very exciting.